Mantegna Tarocchi engravers: Sweynheim, Pannartz, Bucking? "On the other hand there is a close similarity between the present series and the engraved maps of the Ptolemy printed at Rome in 1478. The precise cutting of the maps and the representation of forests and hills are closely related in style. If the engraver of these maps is identified, some solution might be found for the engraver of the socalled Tarocchi might have undertaken the work of the Roman printer." From our own researches to Lazzarelli's life, his connections to the Accademia Romana and my consideration, that Hind made a wrong conclusion about his Mantegna-Tarocchi-origin "around 1465", it seems promising to search for the origin of the final set at a later time than 1465 and in a connection to Lazzarelli and especially in Rome, cause that's the place, which seems to be focused. So two suspicions (Hind's and mine) meet here, although I contradict Hind in his basic assumptions, which regard the Mantegna Tarocchi as produced "around 1465". Hind's citation above give the impression, as if the producer of the Ptolemy, Rome 1478, is completely unknown. However, it isn't and as it seems, not since young times, so I do wonder, why Hind speaks in this way (we've only an excerpt of Hind's extended "Early Italian Engraving", so it's possible, that Hind at other place gives nearer information to this question). The Ptolemy edition from 1478 has the following story: Conrad Sweynheim and Arnold Pannartz had been two printers, which left the workshop of Gutenberg's earlier cooperator Johann Fust in Mainz in the year 1462 and reached Subiaco near Rome in 1464. They are called the "first printers in Italy". Here they started to print, and after 3 years they moved to Rome. This happened parallel to a development, in which the current pope Paul II. threw a lot of writers out of their jobs, persons, who had bought their administative function with some money. But: it's also said, that Paul II. reacted with enthusiasm about the printing machine .... So it seems, that Paul II. realised, that he had too much writers and would need in future more printers, this administative action - which is regarded as a political action, by which the pope earned a lot of money - seems to have been also part of the running media revolution. The writers lost their jobs and function and their open protest did lead to the well known papal attack against the Accademia Romana in 1468, by which some leading heads of the writers earned some time in prison, between them Pomponius Leto and Platina. Pannartz and Sweynheim printed and printed, however, Pope Paul II. died in 1471. Sixtus IV was elected, and 1472 a letter is known, in which the bishop of Aleria, Johannes Andreae Bussi, reported to the pope about difficulties of the printers - they had made 28 different editions and more than 12000 books ... and now they had distribution difficulties, sitting on all this printed papers. It seems plausible to assume a development, in which Paul II had made hope, that he would buy some of the books and the new pope Sixtus didn't fulfill earlier promises, as it often happens in printing business. The problem solved in a specific way. Pannartz kept to the printing business, but Sweynheim turned to the production of a single book since 1473, the mentioned Ptolemy, together with a very active editor of other books, Domitius Calderinus. Conrad Sweynheim died (1475, 1476, 1477 ? ), Domitian Calderinus died (1478), Pannartz died (?). The informations are unclear. A peste is mentioned in Rome 1475/76, Regiomontanus died with it (in the case, he wasn't poisoned by the sons of Trapezunt) and Regiomontanus was also in the printing business in Nurremberg (1474), a contact from him to the German printers in Rome 1475/1476 seems likely. It stays, that in October 1478 an Arnold Bucking was in possession of the Ptolemy-prints and the completed books, which were a finer Ptolemy edition than that illustrated by the Ferrarese Crivelli in Bologna one year before. One theory assumes, that Arnold Bucking was just a second name for Arnold Pannartz. Who was the engraver of the 27 maps of the Ptolemy, from which Hind declares, that this might have been also the engraver of the Mantegna Tarocchi? It seems that Sweynheim with Bucking in assistance or Sweynheim alone or perhaps Bucking alone did the work, although the informations are in a way unclear, that somewhere a hidden artist can't be excluded with 100% security. "Das geographische Werk des Ptolemäus war in damaligen Zeiten der Schatz der geographischen Wissenschaft, und wegen der dabey befindlichen Landcharten, ein überaus kostbares Werk, das nur bey den reichsten Personen angetroffen wurde. Dies bewog einen der ersten aus Deutschland gezogenen Buchdrucker, Conrad Schweinheim, der nebst Arnold Pannartz, die nun ausgebildete Erfindung der Kunst, Bücher zu drucken, nach Rom gebracht, sich aber nachher von ihm getrennet hatte, die in eben denselben Zeiten bekannt gewordene Erfindung, die Kunst in Kupfer zu stechen, zu erlernen, und den Druck so wohl dieses Werks, als der dazugehörigen sieben Landcharten zu unternehmen. Und ob er schon selbst nebst dem Herausgeber des Werks, dem Domitius Calderinus, nach dreyjähriger unabläßiger Arbeit, noch vor deren Beendigung mit Tode abgieng; so ward solches dennoch von einem anderen Deutschen, Arnold Bucking, vollends zustande und im Jahre 1478 im Monat Oktober glücklich an das Licht gebracht. Der erste Anblick dieser Landcharten ist angenehm, ob er gleich die Kennzeichen einer neu angehenden Kunst bemerken läßt; es giebt aber zugleich den Übergang in eine andere Kunst zu erkennen. Die neue Kunst der Kupferstecherei beschäftigte sich nur mit den Bildern, und bey Büchern war ihre Anwendung noch nicht gemacht worden; sie war also hier nicht nur einen Schritt weiter, sondern auch von den Bildern zur Schrift übergegangen; und hierbei hatte Schweinheim seine bisher ausgeübte Buchdruckerkunst angebracht. Er bediente sich bey der in den Charten vorkommenden Schrift und den Namen, eben solcher stählernen Stempel, als der Buchdrucker bey Verfertigung der Formen zum Guß der Buchstaben braucht, und schlug sie, Buchstabe vor Buchstaben, in seine Platte ein. Es ist aber nicht zu bestimmen, ob diese Platten aus Kupfer oder aus Zinn bestanden haben, so wie dergleichen noch itzt in Holland bey den musikakischen Noten gebräuchlich sind. Man wird aber durch die Gleichförmigkeit der Buchstaben davon überzeugt, die kein Kupferstecher nachahmen kann, so aufmerksam und geübt derselbe auch seyn mag. Diese Erfindung ist also sehr alt, und ein Eigenthum der Buchdruckerey." The German text contains partly that, what is described already above, but adds a few remarkable details: Breitkopf mentions, that Sweynheim learnt for the project of the Ptolemy the art of copperplate engraving, which - in my opinion - possibly is a wrong information or a wrong assumption of Breitkopf. At least Sweynheim was above 40 years and that's not the age, when somebody starts to learn a new art, especially at a time, when the request for a learnt printer with much experience should have been great and regarding the result, that the engravings are called an expert work. Likely Sweynheim already knew something about engraving, but the task of a series of big maps was a great attempt he never tried before, so he still had to learn something of the art. Then Breitkopf adds a technical detail of the work, as he could observe it: Sweynheim used stamps for the letters and the inscriptions on the map. The letters are unique in a way, that no copperplate engraver could imitate them as good by another technique. This was - according the observations of Breitkopf - a new invention (one should know, that Breitkopf invented various improvements of printing himself, in regard of "inventions" he was expert). Till ca. 1480 and a little later there are no datable printings of the Mantegna Tarocchi extant - beside four printings of the cardinal virtues in a manuscript of St. Gallen, written in the year 1468. 4 printed virtues do not give evidence for 50 full developed socalled Mantegna Tarocchi engraving. Copperplate engravers usually don't act creative, but reproduce already existent art and writing. It was normal to them to copy already existing objects. When for instance Sweynheim made the Mantegna-Tarocchi in 1475, most motifs would have already existed with the Lazzarelli manuscript. From the Emperor motif we know, that it was used in an illuminated manuscript in Bologna 1467. Calderinus, Sweynheim's Italian partner in the late years, commented a text, which was also commented by Giorgios Merula, Lazzarelli's earlier teacher in Venice. That's the only connection between the group of printers and Lazzarelli's world, that we detected, but perhaps others exist. Calderinus was an active book editor, who participated in a lot of printing productions - such people have a lot of contacts, and they're naturally searched by poets and other persons in the literary business, so of course also by persons around Lazzarelli, the poets. There might have been some hostility between printers and people, who earned their money by copying texts by hand, naturally. As Rome should have had a lot of these persons, and as it seems, that they collected in the Accademia Romana .... The fama, that the sons of Giorgios of Trapezond poisoned Regiomontanus tells a little bit about a general competition. Perhaps there were other tensions, also some with "national" tendencies (it's said, that in Rome 2/3 of the printers in 15th century were Germans). But finally writers and printers should've realised their natural partnership. The prints of Sweynheim and Pannartz and later the prints of Pannartz alone were made in the Palazzo Massimo, the house of two knights Pietro and Francesco Massimo. The house was destroyed during the Sacco di Roma 1527, nowadays there is another new Palazzo Massimo. The Massimo are a very old Roman family and their tradition proceeded till later times. They're said to have had also helped another German printer, Ulrich Han (Udalricus Gallus, also Ulrich Hahn), who turned to Venice then. Arnold Bucking, the "unknown man", has a family name, which often appears in the German city Marburg, it's likely, that he originated from this place. The distance Marburg - Mainz (in Mainz Sweynheim and Pannartz learnt printing) isn't very far, about 100 km. The name Sweynheim is assumed to have developed from a location of Schwanheim, nowadays a part of the city of Frankfurt (also near to Mainz, 50 km, also near to Marburg). The origin of the name Pannartz is completely unknown, familysearch.org with its million of entries of German church records doesn't know anybody with this name. Perhaps the old suggestion has some reality, that Arnold Pannartz (or Arnoldus Pannartz) was identical with Arnold Bucking (who didn't die as suggested at other place). Perhaps "Pannartz" was just a nickname (it sounds in German like this), that Arnold Bucking used for some time for publishing, and later he returned to his real name Bucking. Some souces suggest, that he was from Czechia, one sort states, that in the negotiations of 1473 he was called as "from Cologne". Results: not much to the German printers. They are not listed as "artists" in art dictionaries, as far they were requested. Pannartz is said to have been originally from Cologne, Swanheym from Mainz. Bucking, as already mentioned, is a name common in Marburg. Only one source suggests, that Arnoldus Pannartz is identical with Arnoldus Bucking. Much more data is receivable to Giovanni Andreae Bussi, bishop of Aleria, and also to Domitian Calderinus, both noted as important Italian contacts of the two or three Germans. Each of both has 8-9 pages of biographical data in a requested biographical Italian dictionary. In both biographies the relation to Sweynheim etc. is handled as a minor point. Giovanni Andrae Bussi was born 1417 in Vigevano (west and near to Milano). Bussi had 1435 studies in Paris and was present in 1440 at the school of Vittorino da Feltro in Mantua. Filelfo (then in Milan as house scholar of Filippo Maria Visconti) notes him then in a letter as visitor in Milan, too. He had friendly relationship to Teodore da Gaza, learning Greek. Around 1449/1450 he's in Genua and receives money as a teacher. Contacts to pope Nicolaus V. lead him 1451/1452 to Rome. He serves the cardinal Ludovico Trevisani. With Calixtus III. (1455) he becomes "canonicato" of San Ambrogius in Milan. It seems, that there were some enduring hostility between Francesco Sforza and him. 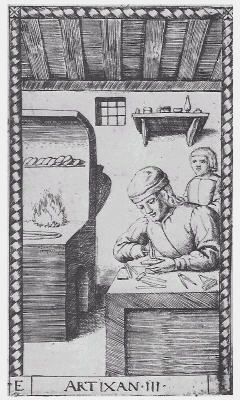 He becomes secretary to Nicolaus Cusanus in 1458, a position, which probably prepares his later contacts to the German printers and which makes Bussi familiar to improvements in German printing industry ("By the account of Giovanni Andrea Bussi, who had been his secretary from 1458 until the cardinal's death in 1464, Cusanus had always desired that the new method of multiplying books should be brought from Germany to Rome." [source]). After the death of pope Pius II. and Cusanus he got churchly functions for Genua (vicario generale in 1464 and was made bishop of Aleria in Corsica in 1466. It seems, that the Milanese hostilities are closed then in Venice in 1466, where Bussi is present. In 1468 his direct cooperation with Sweynheim and Pannartz starts and leads Bussi in complex situations of influence on the appearing texts. Between these activities also a deeper contact to Pomponio Leto is noted, leading figure of the Accademia Romana, also to Platina, also to Campano, once teacher of Lazzarelli, also exchanges with Filelfo. In his function as major cooperator with the German printers - who probably both had the handicap of missing experience in Italian language and mentality - it's likely, that Bussi made the major editorial communications to the outside. Sweynheim and Pannartz parted their business in 1473. Bussi became the papal librarian in that time, Niccolò Perotti, Archbishop of Siponto, seems to have concentrated on the further printing business of Pannartz (Perotti had attacked Bussi cause of editorial mistakes), and the same role for Sweynheim and his Ptolemy project was taken by the much younger Domitian Calderinus. Bussi died 4th of February 1475, 58 years old, his role as papal librarian was taken by Platina and manifested for later times by a famous painting. Sweynheim, Pannartz and Domitian Calderinus, all died soon after Bussi, in October 1478 the "unknown" Arnoldus Bucking appears alone as in possession of the worthful edition of the Ptolemy. Domitian Calderinus (Calderini, Caldarinus) was born in 1446 in Torri del Benaco at the eastside of Lago di Garda near Verona as Domenico, son of Antonio and Margherita di Domenico. He changed his name later according to humanistic customs. He studied in Verona classical literature with a local humanist, Antonio Brognanino or da Brognoligo, and spend about 2 years in Venice with Benedetto Brugnoli da Legnago, before he left to Rome (about 1466/67), where he was attracted immediately by the Accademia Romana and also the circle around cardinal Bessarion. Perhaps he's identical to a "Domitius", addressed by two epigrams of Filippo Callimaco Esperiente, who was accused in 1468 and had to flee the attack of Pope Paul II. in 1468 on the Accademia Romana and left Italy forever. Calderinus first publication experiences are noted since 1469 and then variously. A contact to Bussi (see above) is recorded for February 1469, another to Giorgios of Trapezund, and also an involvement in the conflict between Bessarion and Trapezund. Another mentioned contact is Campano, once teacher to Lazzarelli. As secretary to Bessarion he accompanied the cardinal to his mission to France in 1472, where Bessarion tried successly to get help from the French king against the crusade against the Turks. He should have been in Urbino at least once, as he describes the palace. After the death of Bessarion (November 1472) he was involved in the circle of cardinal Pietro Riario, nephew of Sixtus IV., whose extravagant festivities in 1473 astonished Italy, especially the banquet in honour of Eleanore of Naples on her way to Ferrara at 7th of July 1473. During a visit from July till 14th September 1473 to Florence (Riario became archbishop of Florence then, reason for further exclusive festivities) he became acquainted to the 8 years younger poet Poliziano in Florence, a very interesting relation, as Poliziano later lived in the house of Calderino in Torri and died there (1494), long after the early death of Calderino (1478). Contact was also made to Lorenzo de Medici and the other Florentian humanists. The contact stayed vivid in later years. Various publication activities are recorded for the year 1474, his cooperation with Sweynheim, which is said to have started in 1473, can have taken only a small part of his energies. The young cardinal and sponsor Pietro Riario (28 years) died 5th of January 1474, but the death seems to have affected Calderinus' career only slightly and his personal relation to the papal family stayed good, at 27th of June 1474 Calderinus becomes "segretario apostolico", and is now active mostly in the surrounding of another nephew of the pope, cardinal Giuliano Della Rovere, later pope Julius II, which leads later to another visit and longer stay to France as part of a papal delegation (February - till September 1476 in Lyon). An interest in mythological themes becomes obvious in these years ... something, which is the major topic of Lazzarelli. Beside these activities he's also called a "professor for rhetoric in Rome". He died, probably, in June 1478 during a peste. Bussi and Calderinus appear as central Roman persons, who manage a lot of literary activities, their involvement in the printing business of Sweynheim and Pannartz is that of publical agents of the printers, they build the bridge to the papal society, but by far it is not their only or their major occupation. In the case, that Lazzarelli was in Rome in the critical time, it's likely, that both would have known him, probably cause they likely knew everybody in Rome in the scene of literature during this time. Both had some contacts to Venice, Calderinus by birth and studies likely some more than Bussi. Niccolò Perotti, also Perotto or Nicolaus Perottus, (1429 - 1480), born in Fano, was an Italian humanist and author of the first modern Latin school grammar. He was made Poet Laureate in Bologna by the Emperor Frederick III during his marriage journey in Italy as favour of his speech of welcome. In 1458 he was Archbishop of Siponto, occasionally he officiated also as papal governor in South Italy. He worked as secretary to Cardinal Bessarion. It's said, that he took the position of Bussi for Pannartz in 1473. Earlier he citicised Bussi for his editions and also Calderinus for his work on Martialin specific questions. Together with the Florentine bookseller Vespasiano he collected books for the Papal library.